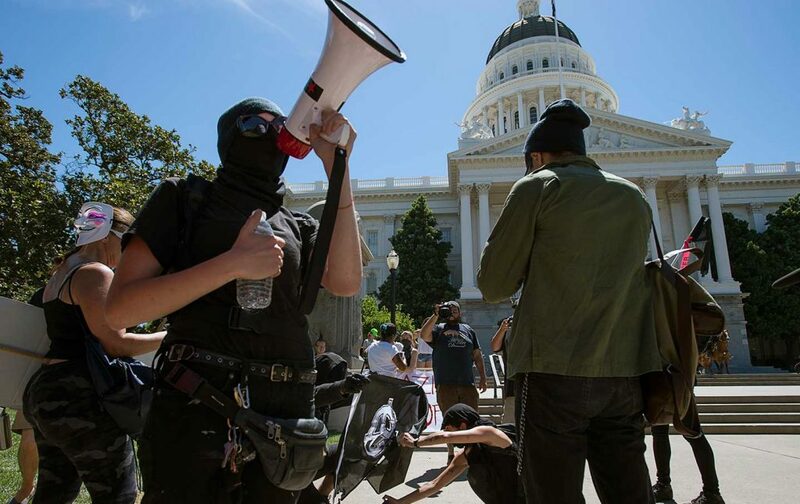 SACRAMENTO – Frustrated and unsure if the jury was being given a clear picture of the bloody chaos at the State Capitol riot in June of 2016, the defense team for white supremacist William Planer Tuesday afternoon put its controversial client on the stand here in Sacramento County Superior Court. The felony trial for assault with great bodily harm has wound its way into a second week. But most of the effort is not in front jurors – who were only in the courtroom about three hours Tuesday – but in battles beyond the jury’s collective earshot, as the prosecution fights to limit many facts surrounding that day from the jurors, and the defense argues jurors should have more, not less, information. In fact, before Planer took the stand later in the day Tuesday, most of the morning was consumed with more legal wrangling. Defense attorney Jem Martin was clearly agitated and frustrated as he attempted to get new photographs and video admitted as evidence. Martin complained that the jury needed to see and hear the “totality” of what happened on June 26, 2016, not just the one incident involving Planer hitting Alice Summers. However, Dept. 18 Judge Stacy Boulware Eurie continued to sustain the objections of Deputy District Attorney Casey Sinclair, greatly limiting what jurors know about the bloody encounter that sent seven people to the hospital in June of 2016. Although defense lawyers usually do not put their clients on the stand, Planer’s testimony – which continues Wednesday morning – was not entirely unexpected because his state of mind is key to his self-defense and defense of others strategy of his legal team. Planer began his testimony mid-afternoon Tuesday explaining how the 20 white supremacist Traditional Workers Party (TWP) group brought shields, but no weapons, with them to the Capitol, because they expected violence from anti-fascists who were posturing around the Capitol early that day. “I saw a larger group of 100 or so counter protestors running toward us, shouting. I knew it posed a threat – they were carrying sticks and throwing projectiles like rocks and bottles. We could not turn back and go another way…they were closing fast. I saw sticks swinging, we were quickly outnumbered,” said Planer. As he continued his narrative, Planer said “they were swarming us…we were in trouble…there were grapefruit sized rocks, and they were hitting us with sticks. I wanted to defend and protect (his TWP members), and ran to the front and pushed people dressed in black people running at us.” Seconds later he said he acquired a stick from an attacker as that attacker swung at him. Planer, accused of hitting anti-fascist Alice Summers in the back of the head with a large pole, didn’t deny he did it. But he did explain to the jury how it was self-defense. He claimed he had just been sprayed in the face with bear mace/pepper spray – backed up by dramatic photos showing him enveloped in an orange spray – and was stunned. “The spray burned me and then I started to run away, and didn’t know which direction. I was scared and panicked, (and) I couldn’t see, and was disoriented. I thought I was completely surrounded. I had blurry vision, and could see dark blurs around me. I was trying to see and retreat, but I knew we were still under attack. “I recall striking out with the stick. I thought they were coming at me. It was complete chaos. I know I was striking out at an attacker,” added Planer, who noted that all he could see was a dark figure in “front of me” and hit it (Summers). But Summers was in a very vulnerable position…on her knees after being pushed to the ground a few seconds before. She later went to the hospital. Planer also noted that after hitting Summers, he spun back and joined his group, largely identifying them by the sound of their voices. It was there, he said, that he struck a number of attackers, breaking his club in pieces. Earlier, Summers testified for a second time during the trial, and was immediately pressured by Jem Martin to admit she was an aggressor, not a victim. “Right before you ran up and started a fist fight, were you part of the group that confronted TWP?” asked Mr. Martin, but the judge barred Summers from answering. But later Summers said, “I remember walking around, but some damage was done (because of the blow to her head) to my ability to recollect,” adding she didn’t have a clear memory of the day or incident. “I remember bits and pieces. We were trying to protest. We didn’t organize flag football. Martin then probed whether Summers had a medical diagnoses that she had memory loss. But Summers would not or could not answer. The judge eventually disallowed the question. When Martin showed her a photo in which she identified as herself, and that depicted her kicking at the protest, Summers said she could not remember doing it. Another TWP participant also testified Tuesday. Sean Wurzburg, a friend of Planer for three years, said much that was confirmed by Planer later, including that they had shields to “protect ourselves from rocks and bricks to be thrown at us, which happened. Wurzburg’s testimony mirrored Planer’s except Wurzburg described the crowd of counter protestors as much larger. Previous : Who Was Driving under the Influence, Husband or Wife?